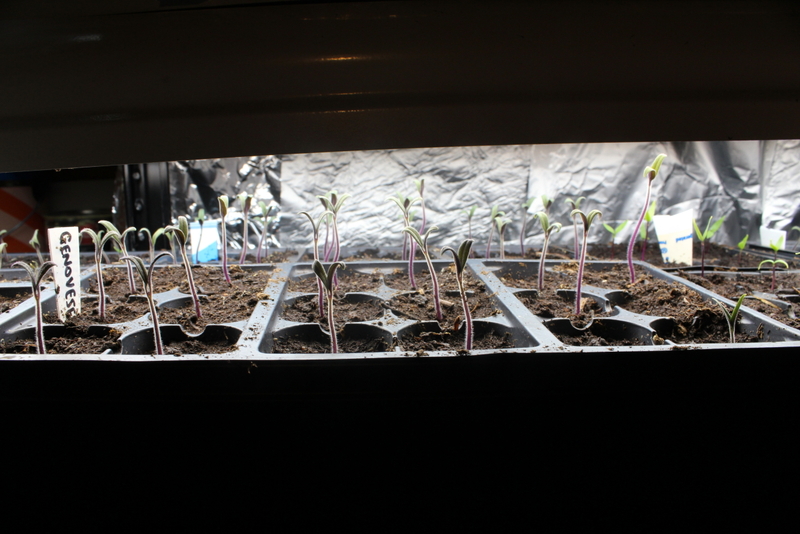 Seed Starting: New and Improved! We’ve upgraded our seed-starting operation for this year. From our homemade grow light fixtures, we’ve graduated to four fluorescent shop lights hung on a 6′ x 3′ metal shelving unit. 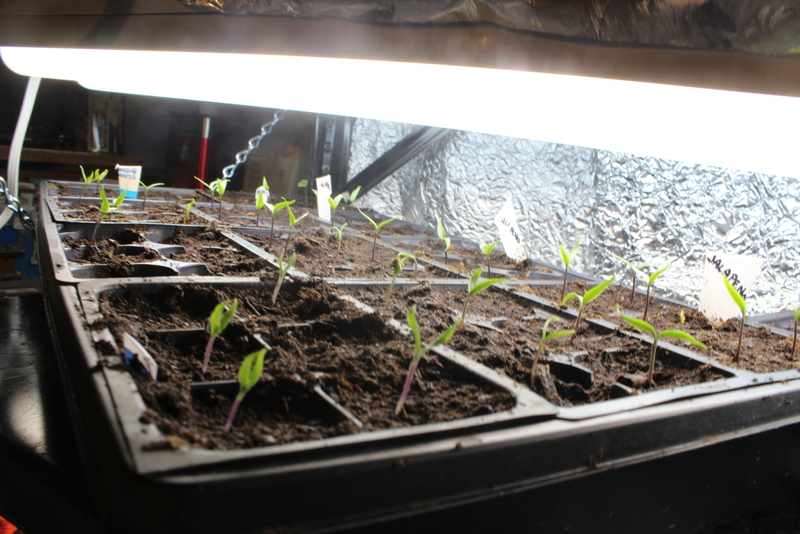 Right now we have about 1,000 seedlings under these lights in our basement; last year our set-up only allowed us to start about 300 at a time. It all started when we acquired this metal shelving unit and all the light fixtures from Eric’s grandfather, who passed away last year. He was a talented craftsman, and his resourcefulness inspired us to create this set up. We hung each fluorescent light fixture to the underside of the shelves using chain and wire to suspend them. This will allow us to raise and lower the lights as needed. We also lined the back with foil to reflect light. We started our seeds on February 9. We use the Jiffy seedling trays, which contain 72 cells for individual seedlings and come with greenhouse lids to help with germination. We’ve reused ours year after year. 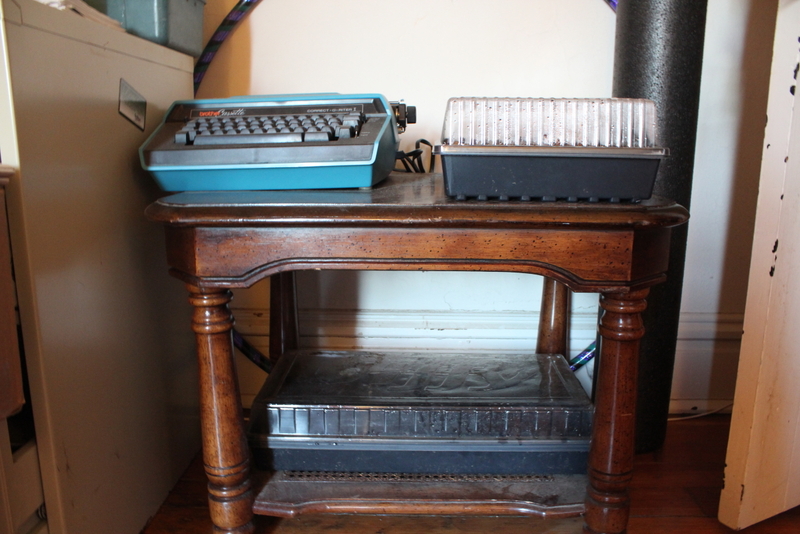 We speed up germination by putting some of the trays on heating pads made specifically for growing seedlings. We only have two of these pads, so we got creative. 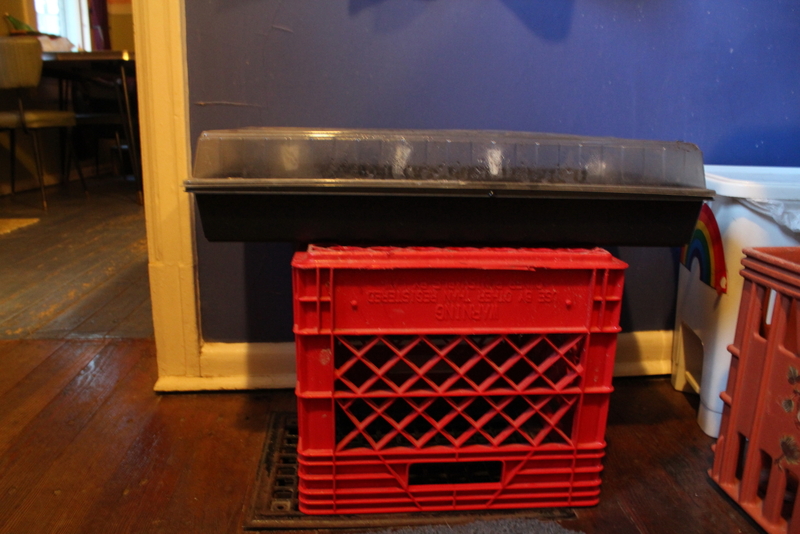 In the left photo, we put a milk crate upside down over a register and placed a seedling tray on top. The right photo shows a small side table with a wicker bottom shelf we placed over a register, which housed two full trays. The majority of the tomatoes germinated within 1 week. 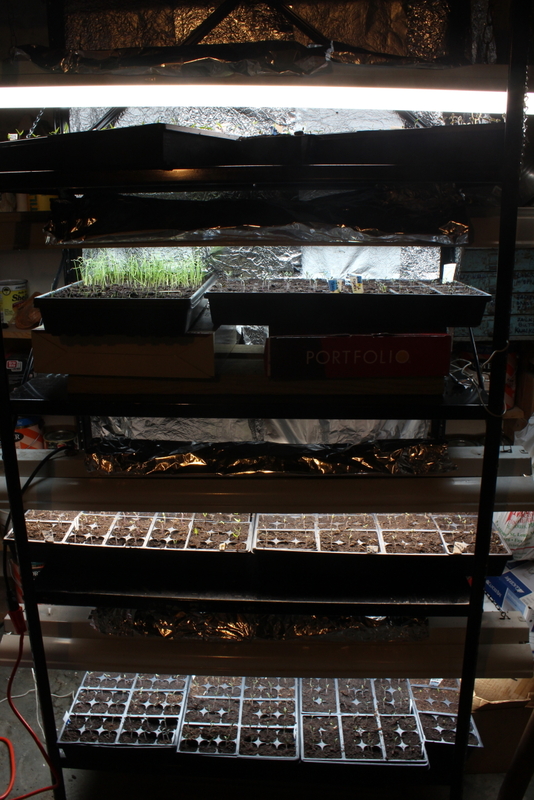 We removed the lids and put the trays under lights once germinated. This photo was taken February 16. For our onions this year, we planted our seeds in a tray without cells. 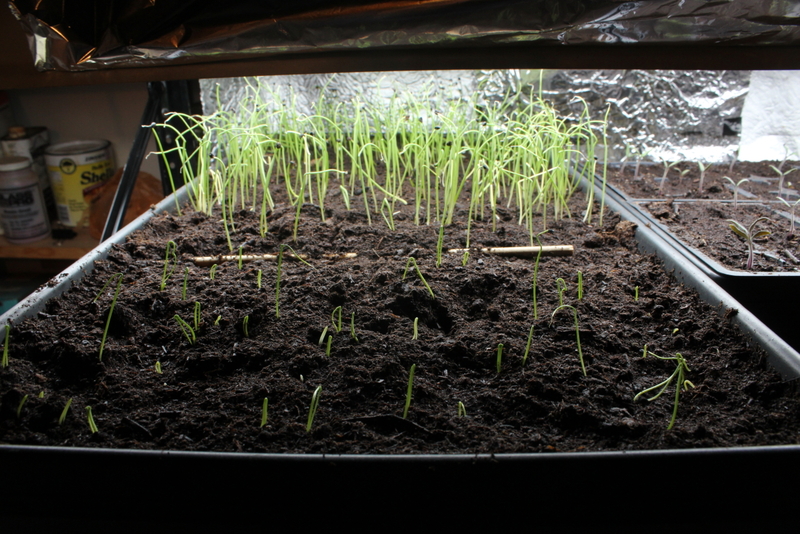 Half of the tray is planted with red onion, the other half is green onion. We’ll buy slips for white or yellow onions, depending on what we can find locally. These are some of our pepper seedlings. This year we’re growing jalapeno, banana peppers, an heirloom variety from Baker Creek called lipstick, Marconi, and chocolate bell. 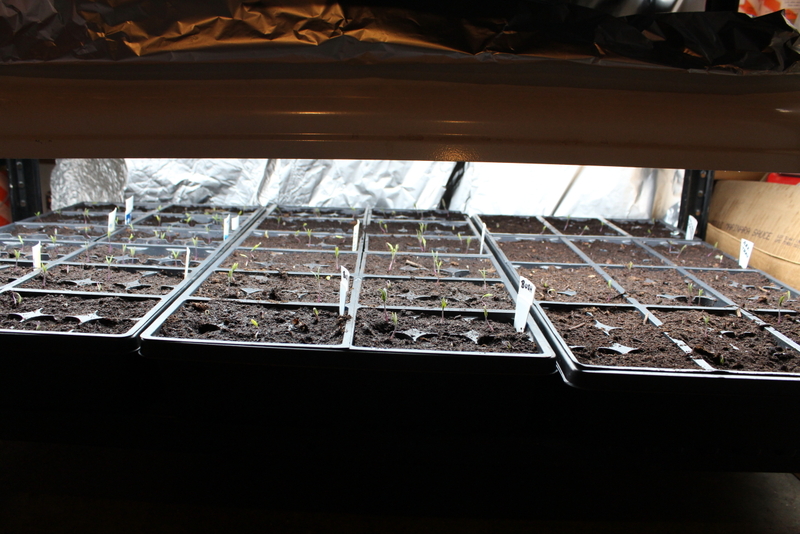 The peppers take a little longer to germinate than tomatoes. We planted an entire tray with one of our favorite varieties of tomatoes from last year- Costoluto Genovese. If you look toward the right side of the photo, you can see a seedling that shot up faster and taller than its fellow seedlings; we’ll be documenting this plant’s progress throughout the year, and if it lives up to its explosive beginnings, we’ll make sure to save seeds for next year! A sea of tomatoes… we planted a tray of Arkansas Travelers and a bush variety we’ve been saving seeds from for years. We also have two full trays of cherry tomato varieties, including our favorite yellow, as well as some sungold, purple, and red. In smaller quantities, we started heirloom varieties Millionaire and Pierce’s Pride from Baker Creek (given to us free last year), Black Giant, Black Pineapple, and White Wonder. 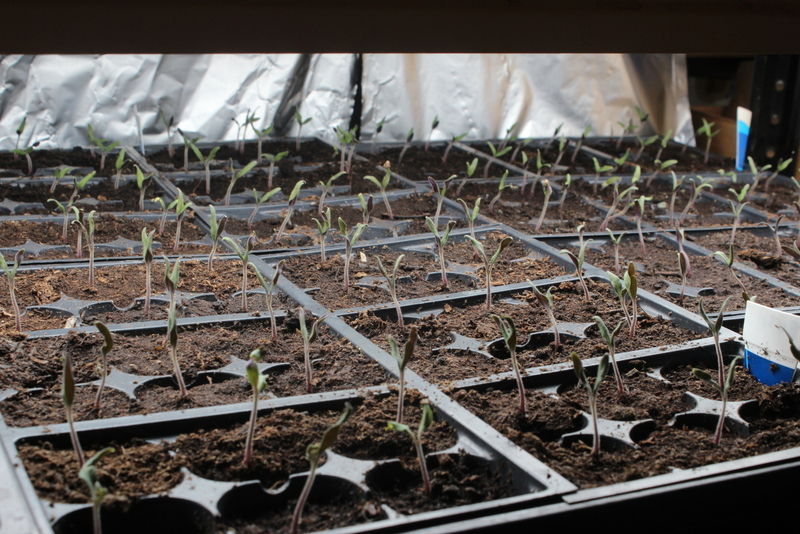 We plan to plant about 100 tomato and 50 pepper plants this season. We’ll be selling the rest in the St. Louis area. 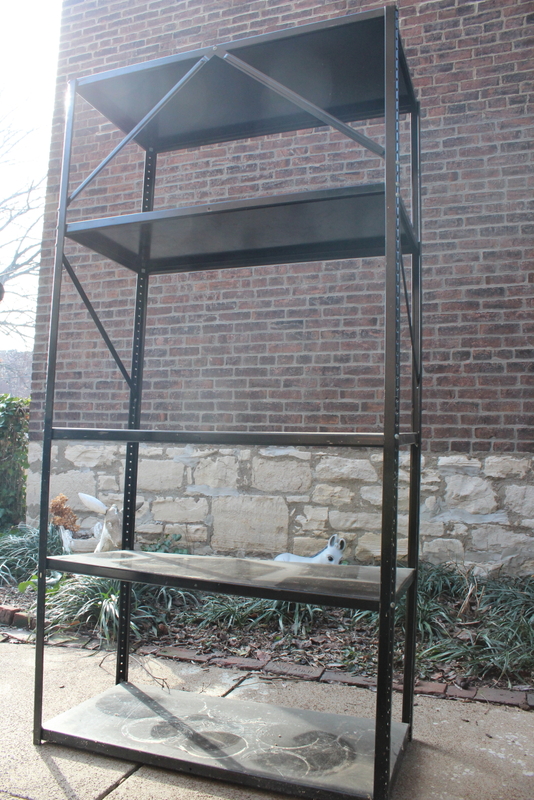 We’ll be up-potting these soon and will continue to document the progress!